What Types Of Siding Are Used On Homes? The next major step for the exterior of the house is the vinyl siding. Ryland uses Owens Corning brand siding, as it is of a high quality, the color pigment runs completely through the vinyl, meaning no “white scratches” if it is damaged. Of course, vinyl is very easy to maintain, it is breathable to allow fresh air in and keep moisture out. The vinyl siding is installed from the bottom up by a crew of four using scaffolding that can ratchet up in elevation while in use. The pieces are interlocked in to the pieces below them and secured with short nails on top. The process is fairly slow, even for a home with as simple shape as ours. Not only are the workers installing the large areas of the siding, but all of the corners, vinyl trim, window trim, vents and shudders. The work is precise, with a lot of attention to detail. Of note, the siding installers may opt to work after dark, as with some of the homes in the neighborhood. This can lead to un-even runs of siding as with some of the houses in the area. Our contractors promptly packed up and left every day before dark, so it was not an issue. I expect this is professional practice with the vast majority of siding installers, but it is a pitfall to beware. If you are planning to give your home a new look, then vinyl siding is definitely an excellent choice. Siding will not only help in the enhancement of your home in terms of style, it can also be very functional as well. Various sidings can have different effects to your home. In the same manner, there are also advantages and disadvantages for sidings. For instance, there are certain types of siding which work best in particular conditions. In the same manner, some types of siding can withstand certain temperatures better. There are also sidings, which are more durable than others are. You will also find siding that is easier to maintain as compared to others. This can be an excellent choice if you do not have enough time to attend to it and regularly maintain it; or if you do not want to hire and pay extra help just to maintain the exterior of your home. Essentially, the main point here is that you can and will find various types of sidings that will fit the circumstances surrounding your home. In fact, it is imperative that you find the type of siding for your home that can withstand the circumstances and conditions in your area, but that which is also stylish and functional in other ways. In relation to this, you actually have many choices. Here are some of your choices in terms of materials for siding for your home. The most preferred type of siding for the home is vinyl. As you may know, vinyl is made from PVC. There are many things to love about vinyl siding for the home. For one, there are many colors and variations of vinyl siding that you can choose from. In this respect, you should find the color that will match or go well with the current color of your roof or roof shingles and theme of your home. Another benefit from vinyl siding is the fact that it is very easy to maintain. Thus, you will not have to go through the hassle of attending to it so often. This can be helpful, especially when you are the busy type. Lastly, it is considerably cheaper compared to other types of siding. Thus, if you are working on a tight budget, but you do not want to compromise style and functionality, then this will be an excellent choice. Another common type of material for sidings for homes is wood. A lot of homeowners and designers actually prefer this type of siding because it is durable. Thus, it can withstand even harsh climactic conditions and weathering. In the same manner, it also boasts insulating qualities. Another good asset of this type of siding is that it is easy to install as well as to repair. As a matter of fact, if you are a repairperson yourself and if you have the right materials, you can do the installation and repair yourself. If you do not mind extra costs, you can hire a professional contractor to do the job for you. However, some homeowners and designers find this material to be a bit too plain. If this is another consideration for you, too, then you will be delighted to know that you can actually have it painted or stained according to the design you prefer. Lastly, another drawback when using a wooden siding for your home is the fact that mold, algae or some other fungi may grow on it. Eventually this type of problem may cause the wood to rot. You can explore siding options at a building supply store near you. These stores will usually have many types of siding on display for you to look at. The experts at the store will be able to answer questions you may have regarding the type of siding you are interested in and the durability of the siding. 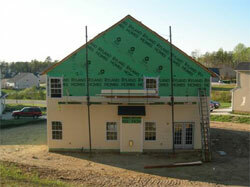 They may also be able to supply you with a contractor that will put the siding up for you. Take a drive through local developments to get an idea of the colors you may be interested in. In some instances, if the development is new and still selling houses, you can visit the building company in one of the model houses and they may assist you with the type of siding they use, as well as the color choices.